The Sri Lanka Armed Forces is the overall unified military of the Democratic Socialist Republic of Sri Lanka encompassing the Sri Lanka Army, the Sri Lanka Navy, and the Sri Lanka Air Force; they are governed by the Ministry of Defence (MoD). The three services have around 346,700 active personnel; conscription has never been imposed in Sri Lanka. The Sri Lanka Coast Guard is also under the purview of the Ministry of Defence but is staffed by civilian personal. Sri Lanka has a military history going back to more than 2000 years. The roots of the modern Sri Lankan military lead back to the colonial era when the Portuguese, Dutch and British established local militias to support their wars against the local Kingdoms. The British created the Ceylon Rifle Regiment during the Kandyan wars. Although it had natives in its ranks, it was largely composed of Malays. It was disbanded in 1873. The lineage of the Sri Lanka Armed Forces dates back to 1881, when the British created a volunteer reserve on the island named the Ceylon Light Infantry Volunteers. Created to supplement the British garrison in Ceylon in the event of an external threat, it gradually increased in size. In 1910 it was renamed the Ceylon Defence Force (CDF) and consisted of several regiments. The CDF mobilized for home defence in World War I and again in World War II when its units were deployed along with allied forces in Asia and Africa. At the end of the war it has grown in size to that of an independent brigade, but was de-mobilized in 1946 and disbanded in 1949. In 1937 the Ceylon Naval Volunteer Force was established (later renamed as the Ceylon Royal Naval Volunteer Reserve (CRNVR)), it was mobilized for war in 1939 and was incorporated into the Royal Navy. Following establishment of the Dominion of Ceylon with Britain granting independence in 1948, work began to establish a regular military. The Army Act No. 17 of 1949 was passed by Parliament on April 11, 1949 and formalized in the Gazette Extraordinary No. 10028 of October 10, 1949. This marked the creation of the Ceylon Army, and the CDF the CRNVR were disbanded to make way for a regular navy. On December 9, 1950 the Royal Ceylon Navy (RCyN) was established. Finally in 1951 the Royal Ceylon Air Force (RCyAF) was established as the youngest of the three forces. From the outset Britain played a significant role in helping the Ceylon government in developing its armed forces. The growth of the Ceylon Armed Forces was slow due to lack of foreign threat, since Ceylon maintained cordial relations with its neighbor India and had a defence treaty with Britain. In the 1950s it was mainly employed in internal security assisting the police. There was an attempted coup in 1962 by a group of reservists, which led to cuts in military spending and the disbandment of several regiments. This, together with the lack of an intelligence agency, left it ill-prepared for the insurgency launched by the Marxist JVP in April 1971. The 1971 JVP Insurrection saw Ceylon Armed Forces mobilizing for combat operations for the first time and its size grew rapidly. The insurrection was brought under control in a few months. In 1972 Ceylon became a republic and the Ceylon Armed Forces became the Sri Lanka Armed Forces. By the early 1980s, the Sri Lanka Armed Forces mobilized against the insurgency of Tamil militant groups in the north of the island. This was the beginning of the Sri Lankan Civil War. The size of the Armed Forces grew rapidly in the 1980s. By the mid-1980s, the Armed Forces began launching operations in the like of conventional warfare against the LTTE which had by then became the most powerful of the Tamil militant groups. This led to India intervening by entering Sri Lankan air space to carry out food drops. Shortly afterward the Indo-Sri Lankan Accord was signed and the Indian Peace Keeping Force (IPKF) was sent to Sri Lanka to establish peace. The military was redistricted to its bases but was soon involved in another insurrection by the JVP in the south of the island from 1987 to 1989. In the north, tension increased with the LTTE and the IPKF leading to open war with the two suffering heavy casualties. In 1990 the IPKF pulled out and the war commenced with the Sri Lanka Armed Forces and the LTTE. In 1994, a brief ceasefire came into place and peace talks began. The ceasefire ended when the LTTE attacked several docked naval gunboats. The phase of the war that followed, known as Eelam War III, saw a conventional war taking place in the northern and eastern provinces of the island and terrorist attacks in other parts of the country. The Sri Lankan Army began deploying full divisions in offensive operations and the Navy and Air Force increased their inventories to support the Army. In 2002, a new ceasefire was established with Norwegian mediation and peace talks began. The SLMM was established to monitor the ceasefire and certain progress archived until the LTTE withdrew from the peace talks in 2003. Although the ceasefire continued no peace talks took place till 2005. In the mean time the Sri Lanka Monitoring Mission (SLMM) filed a report stating the LTTE had violated the ceasefire 3,471 times since the signing of the cease fire, including matters such as child recruiting, torture, abduction, firing of weapons, sabotage, carrying of arms in government-held areas, construction of new positions, movement of arms, ammunition and military equipment, denial of access to families of detainees and the obstruction of truce monitors. However the security forces violated the ceasefire only 162 times. Some defence reforms also commenced in 2002 when the Prime Minister established the Defence Review Committee (DRC) which formulated extensive recommendations that encapsulate force modernization as well as restructuring of command and control in ways that would make the army more responsive to civil control. The first task of the Committee was to assess Higher Defence Organisation, given the decision by the President to relinquish the defence portfolio. When a paper drafted by the Committee was inadevertantly made public, concerns were raised that the Committee's recommendations for restructuring Higher Defence Organisation might be constitutionally flawed in relation to the role of the President as Commander -in-Chief of the Sri Lankan armed forces. Although the work of the Committee thereafter proceeded apace, the DRC itself became a political football amidst the growing tension between the President and the Prime Minister. In 2003 the President took the decision to bring an end to the work of the DRC and, instead, assigned the task of SSR to the Joint Operations Headquarters, since when little progress has been evident. In April 2006 following a suicide bomb attack on the Commander of the Army, air strikes began followed by skirmishes, however both the government and the LTTE claimed that the ceasefire was still in place. Offensive by the Armed Forces was launched when the LTTE closed the sluice gates of the Mavil Aru reservoir on July 21 and cut the water supply to 15,000 villages in government controlled areas. This led to several major attacks by the LTTE in the eastern province and the north. The Armed Forces went on the offensive successfully liberating LTTE control areas in the eastern province during 2007. In 2017 Sri Lanka Armed Forced deployed nearly 10,000 personnel and equipment for relief, help and rescue operations of 2017 Sri Lanka floods. This is the biggest military deployment of the peacetime. On 3 January 2008 the government informed Norway of its decision to quit the ceasefire, with it the ceasefire officially ended on 16 January 2008, following several bombings in the capital. Along with the ceasefire operations of the SLMM also ended. During 2008 there was heavy fighting in the northern province where the Sri Lanka Armed Forces launched major offensives and succeeded in liberating LTTE controlled areas of the Mannar District, the Vavuniya District and moving into the Mullaitivu District and Kilinochchi District. During December 2008, the Sri Lankan Armed Forces were engaged in offensives on all fronts, with heavy fighting around Kilinochchi (where the LTTE had its headquarters) and close to Mullaitivu. In early 2009 the Armed Forces liberated in quick succession Kilinochchi and the strategically important Elephant Pass. Thus establishing a land route to the government controlled Jaffna Peninsula which had been supplied by sea and air for over 10 years after its liberation in 1995. Shortly thereafter Mullaitivu was liberated by the 59th Division of the SLA. Boxed into a small land area north of Mullaitivu, the LTTE with its remaining cadres and leadership was effectively trapped, with this land mass being slowly reduced until May 2009. On 19 May 2009, the Sri Lanka Armed Forces won its final battle against the LTTE with the death of several LTTE leaders, including its head Velupillai Prabhakaran while he was attempting to flee. On 22 May 2009, Sri Lankan Defence Secretary Gotabhaya Rajapaksa confirmed that 6,261 personnel of the Sri Lankan Armed Forces had lost their lives and 29,551 were wounded during Eelam War IV since July 2006. The Armed Forces along with the LTTE have been accused of committing war crimes during the war, particularly during the final stages. A panel of experts appointed by UN Secretary-General Ban Ki-moon to advise him on the issue of accountability with regard to any alleged violations of international human rights and humanitarian law during the final stages of the civil war found "credible allegations" which, if proven, indicated that war crimes and crimes against humanity were committed by the Sri Lankan Armed Forces and the Tamil Tigers. The posture of the military has been defensive due to the nature of the strategic threats to Sri Lanka. In the short-term, internal security is considered the main threat to the nation's future. In the long-term, the threat is seen as primarily external from current and future superpowers in their rival quests for dominance of the Indian Ocean; at one point these were the United States of America and the Union of Soviet Socialist Republics. However, due to collapse of the Soviet Union in 1991, the external threats now involve possible future superpowers India and China. The signing of the Indo-Sri Lanka Peace Accord eased these concerns. The military of Sri Lanka has received a significant amount of military aid from the People's Republic of China. Throughout the period from 2005 onwards, as a symbol of goodwill and cooperation between the two countries in terms of security, China has supplied the Sri Lankan army with Chinese military equipment. Weapons provided by China include small arms, tanks, and howitzers, as well as mobile vehicles. This can be seen as China's attempt to gain leverage against other power blocs, mainly India, within the Indian Ocean. Sri Lanka also imports high-tech weapon systems from Israel. The Ministry of Defence is responsible for the management of the forces, while the planning and execution of combined operations is the responsibility of the Joint Operations Command (JOC). The JOC is headed by the Chief of the Defence Staff who is the most senior officer in the Armed Forces and is an appointment that can be held by an Air Chief Marshal, Admiral, or General. The three services have their own respective professional chiefs: the Commander of the Army, the Commander of the Navy and the Commander of the Air Force, who have much autonomy. The Sri Lanka Army is the oldest and largest of Sri Lanka's three armed services. Established as the Royal Ceylon Army in 1949, it was renamed when Sri Lanka became a republic in 1972. The Army of approximately 203,000 regular and reserve personnel including 73,000 National Guardsmen and is responsible for overseeing land-based military and humanitarian operations. At present the army has deployed 12 divisions and forming 4 more in while carrying out combat operations. Since 2004 the Sri Lankan Army maintains a battalion and support units for 1000 personnel in the United Nations peacekeeping operations in Haiti. The Sri Lankan Navy with approximately 48,000 personal is the key maritime division of the Sri Lankan Armed Forces and is classed as the most vital defence force of Sri Lanka. It conducts maritime operations at sea for the defence of the Sri Lankan nation and its interests. The professional head of the navy is the Commander of the navy, who exercises his command from the Naval Headquarters in Colombo. Established in 1950 as the Royal Ceylon Navy it was renamed as the Sri Lanka Navy in 1972. In recent years it had played a key role it the Sri Lankan civil war, conducting deep sea, coastal & inshore patrols, amphibious and supply operations. The navy has its own elite naval special forces unit, the Special Boat Squadron. The Sri Lanka Air Force with approximately 28,700 personal is the aerial defense division and the youngest of the Sri Lankan Tri Forces. Founded in 1951 as the Royal Ceylon Air Force, it relied on the British Royal Air Force for its earliest equipment, training, and leadership. The Air Force played a major role in the war against Tamil separatists. Although Sri Lanka is only a small island state, its Air Force has proven highly capable and efficient. In recent times the air force has expanded to specialize mainly in providing air-support to ground forces and landing troops and carrying airstrikes on rebel held areas in the Northern and Eastern provinces. The Sri Lankan Coast Guard was established in 2010 and is under the purview of the Ministry of Defence, staffed by civilian personnel. The Special Task Force comes under the control of the Sri Lanka Police which in turn is under the command of the Ministry of Defence. It undertakes counter-terrorist operations and VIP protection. The Sri Lanka Civil Defence Force, which is under direct command of the Ministry of Defence. Today the training of all armed services are carried out in Sri Lanka. 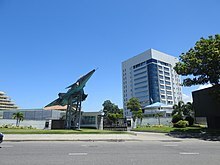 With a Defence University, a Staff College, three Military Academies for the three armed services and many specialized training schools and centers members of the Sri Lanka armed forces have a high level training and professionalism. The Sri Lankan military has received specialized training assistance from other nations such as China, Pakistan, Australia, the United Kingdom, Israel, the United States, India, and South Africa. Referring to the overseas military training given to Sri Lanka, the U.S. government's contribution at a higher level. The Foreign Military Financing (FMF) and International Military Education and Training (IMET) programs helping to standardizing and strengthening the country's military greatly. In 2018, Centre for Research & Development (CRD) Ministry of Defence developed indigenous 107mm Multi barrel rocket launcher, 122mm Multi barrel rocket launcher System and Guided Naval Missile (CRD18-LGMS-001SR). Naval missile will fitted for the Sri Lanka Navy Vessels in near future. The 122mm Multi Barrel Rocket Systems was unveiled for the first time at the 71st Independence Day Parade. The launcher, digital fire control system and rocket ammunition as well as the rocket fuel was developed locally by the CRD. The prototype Launcher was a 10-barrel rocket launcher with a maximum firing range of about 20 km. Currently CRD is creating a 20-barrel MBRL and a naval variant. The CRD has also developed prototype UAVs, communication and IED Jammers, naval gun stabilisers and simulators for field artillery, aircraft training and small arms firing as well as the Hi-Tech Soldier system which allows greater coordination and transfer of information for Network-centric Warfare. The highest military decoration awarded by the tri-forces is the Parama Weera Vibhushanaya, awarded to all regular and volunteer officers and service personnel who display extraordinary individual bravery in combat; thus far, all PWVs have been posthumous. A related award is the Uththama Pooja Pranama Padakkama, an exclusively posthumous decoration awarded to the family or next-of-kin of service personnel confirmed to be killed- or missing in action. The highest civilian decoration awarded by the armed forces of Sri Lanka is the Weerodara Vibhushanaya, the military equivalent being the Weera Wickrama Vibhushanaya. The most recent commemorative decoration awarded was the Sri Lanka Air Force 50th Anniversary Medal, awarded in 2001. The armed forces (especially the Army) awards campaign medals for personnel that have taken part in successful, notable and high-risk operations: the first of these was the Vadamarachchi Operation Medal in 1983, while the latest (the Northern and Eastern Humanitarian Operations Medals) were awarded in 2010, following the conclusion of the Eelam War. Since the end of the civil war in May 2009 Sri Lanka's 300,000 strong military has increased its non-military activities, leading to accusations of militarisation and even military rule. The military is involved in everything from large scale property developments to the running of roadside cafes. The military has built roads, bridges, houses and stadiums. The Urban Development Authority, which spends hundreds billions of rupees a year, was taken over by the Ministry of Defence in 2010. A year later the ministry was renamed Ministry of Defence and Urban Development. The ministry will have a budget of 229.9 billion rupees ($2.1 billion) in 2012, the largest of any government ministry. In early 2011, as food prices soared, the Army bought vegetables from farmers and then sold them to the public at a below market prices. Some of the vegetables came from military farms. The Army also runs a travel agency called Air Travel Services (Pvt) Ltd selling air-tickets and foreign package holidays. In the war affected north of the country, where the military presence is significantly higher than the rest of the country even after the end of the conflict, the military operates numerous small restaurants and shops catering mainly for tourists from the south. Most of the roadside cafes along the A9 highway are owned and operated by the Army. The Army runs a luxurious holiday resort called Thalsevana near Kankesanthurai inside the Valikamam North High Security Zone where the residents were forcibly expelled in the early 1990s and have not been allowed to resettle despite the end of the civil war. The Army also runs two other holiday resorts, one in Kukuleganga and the other in Wadduwa. In November 2011 it was announced that the Army would build a five star hotel in Colombo. During 2010-11, whilst local government was suspended in Colombo using emergency regulations, the Army took over many of the functions of the Colombo Municipal Council such as supervision of the collection of rubbish, demolition of low income housing and even decoration of the streets during festivals. The Navy's Jetliner (A542) passenger ship is used as a recreational cruise ship providing onboard weddings, receptions, corporate events, parties and other social functions. The Navy's A543 vessel provides a whale and dolphin watching service for tourists. The Navy also provides a canal-boat service in Colombo from Wellawatta to Nawala, a boat service to Adam's Bridge for tourists and a vegetable shop. Helitours is the commercial arm of the Air Force established in the 1970s. It was inactive during the civil war but after its end the business has started functioning again, taking advantage of the country's booming tourism. From 2011 all undergraduates are required to take part in compulsory leadership training and the government has chosen the military to provide this training. In November 2011 it was announced that the military would take over the maintenance of the country's three international cricket stadiums from the financially troubled national cricket board. The Army has taken over the Hambantota Cricket Stadium, the Navy Pallekele Cricket Stadium and the Air Force Premadasa Stadium. Many senior military commanders have been appointed to senior positions in the diplomatic and civil services: Air Chief Marshal Jayalath Weerakkody is the High Commissioner to Pakistan; Air Chief Marshal Donald Perera is the Ambassador to Israel; Major General Nanda Mallawaarachchi is the Ambassador to Indonesia; Major General Udaya Perera is the Deputy High Commissioner to Malaysia; Major General Jagath Dias is the Deputy Ambassador to Germany, Switzerland and the Vatican; Major General Shavendra Silva is the Deputy Permanent Representative to the UN; Admiral Wasantha Karannagoda is the Ambassador to Japan; Admiral Thisara Samarasinghe is the High Commissioner to Australia; Major General Amal Karunasekara is the chargé d'affaires in Eritrea; Major General G. A. Chandrasiri is the Governor of Northern Province; Mohan Wijewickrema s the Governor of Eastern Province; Rohan Daluwatte is the Chairman of the National Gem and Jewellery Authority; and Lieutenant General Jagath Jayasuriya and Air Chief Marshal Roshan Goonetilleke are board members of the Water's Edge Complex. ^ "SL Navy exports 9 Patrol Craft to Nigeria". Archived from the original on 27 August 2018. Retrieved 19 February 2019. ^ "Sri Lanka News - Geneva talks must focus on SLMM rulings on violations ? Military". www.lankanewspapers.com. Archived from the original on 19 August 2007. ^ "Sri Lanka hails record military deployment as toll hits 213". dailymail.co.uk. 5 June 2017. Archived from the original on 9 December 2017. ^ "CFA, SLMM cease to operate by Jan 16, Defence.lk". Archived from the original on 8 January 2008. ^ "The Last Day of Prabhakaran, D.B.S. Jeyaraj, Daily Mirror". Archived from the original on 21 June 2009. Retrieved 23 May 2009. ^ "Report of the UNSG's panel of experts on accountability in SL". The Island, Sri Lanka. 16 April 2011. Archived from the original on 23 April 2011. ^ "UN panel admits international failure in Vanni war, calls for investigations". TamilNet. 16 April 2011. Archived from the original on 18 April 2011. ^ "Summary of UN Panel report". Daily Mirror (Sri Lanka). 16 April 2011. Archived from the original on 19 April 2011. Retrieved 22 April 2011. ^ "South Asia | Sri Lanka defence budget to soar". BBC News. 10 October 2007. Archived from the original on 5 December 2013. Retrieved 21 May 2013. ^ Anusha Ondaatjie / Bloomberg (9 October 2008). "Sri Lanka earmarks record amount for defence spending". Livemint. Archived from the original on 5 December 2013. Retrieved 21 May 2013. ^ "Sri Lanka hikes defense spending to record high". Archived from the original on 6 February 2015. Retrieved 6 February 2015. ^ "Defence allocation rises, education up four-fold, President's budget slashed". Archived from the original on 14 October 2015. Retrieved 11 October 2015. ^ "Allocation for defense remains at top in Sri Lanka's appropriation bill". Archived from the original on 21 October 2016. Retrieved 11 October 2016. ^ a b "Sri Lanka, PRIMARY THREATS TO NATIONAL SECURITY". Archived from the original on 10 January 2009. Retrieved 6 February 2015. ^ "中国制造坦克成"斯里兰卡"政府军开路先锋![组图]-军事-CHN强国网". Archived from the original on 24 February 2012. Retrieved 6 February 2015. ^ "印学者：中国幕后军援斯里兰卡政府打内战". Archived from the original on 16 July 2012. ^ "中国的斯里兰卡战役 （原创军贴） - 未名空间(mitbbs.com)". Archived from the original on 6 February 2015. Retrieved 6 February 2015. ^ "中国产坦克成斯里兰卡政府军的开路先锋". Archived from the original on 16 July 2012. ^ "灭猛虎急先锋,中国坦克在斯里兰卡纵横驰骋". Archived from the original on 19 July 2012. ^ "Hiru News". Archived from the original on 29 July 2015. Retrieved 7 June 2015. ^ "Sri Lanka: Security Assistance". U.S. Department of State. 12 July 2007. Archived from the original on 15 October 2015. ^ "Sri Lanka Ordnance Corps". alt.army.lk. Archived from the original on 4 February 2019. Retrieved 4 February 2019. ^ Nonis, Anton (25 April 2004). "The evolution of the indigenous armoured vehicle: From Unicorn to Unibuffel". The Sunday Observer. Archived from the original on 30 September 2007. Retrieved 16 March 2007. ^ "First ever missile & multi-barrel rocket launcher produced in SL on display today". 28 November 2018. Archived from the original on 26 January 2019. Retrieved 26 January 2019. ^ "SL to manufacture a 20-barrel MBRL". 6 February 2019. Archived from the original on 6 February 2019. Retrieved 6 February 2019. ^ "First locally-made MBRL takes pride of place at parade". The Sunday Times Sri Lanka. Retrieved 24 February 2019. ^ "Impressed Commander Wants CRD to Begin Mass Production for Tri-Services | Sri Lanka Army". www.army.lk. Retrieved 10 March 2019. ^ "Military boffins now into R&D to meet peacetime situations | The Sunday Times Sri Lanka". Archived from the original on 30 June 2018. Retrieved 7 April 2019. ^ a b c d e f g h i j k l "In bigger barracks". The Economist. 2 June 2011. Archived from the original on 14 February 2014. ^ a b c d e "Lanka hands over upkeep of stadiums to military". Gulf Times. 5 November 2011. Archived from the original on 6 November 2011. ^ Gunasekara, Tisaranee (6 November 2011). "Rewarding Illegality; Enthroning Injustice". Sunday Leader. Archived from the original on 8 November 2011. ^ a b c d e f g h Bedi, Rahul (20 August 2011). "Armed, dangerous and building their own empires". The New Zealand Herald. Archived from the original on 21 August 2011. Retrieved 6 November 2011. ^ Hemmathagama, Ashwin (23 October 2011). "Government May Borrow More!". Sunday Leader. Archived from the original on 26 October 2011. ^ a b c d e Haviland, Charles (14 March 2011). "Sri Lanka army opens travel wing". BBC Sinhala. ^ "Defence Ministry adds UD to its name". Daily FT. 17 October 2011. Archived from the original on 1 April 2012. ^ "Estimated income - Rs. 1115 b., expenditure –Rs. 2220 b." Sunday Times (Sri Lanka). 16 October 2011. Archived from the original on 20 October 2011. ^ Haviland, Charles (7 January 2011). "Sri Lanka army becomes vegetable vendor as prices rise". BBC News. Archived from the original on 11 June 2012. ^ Bateman, Gibson (22 October 2011). "The Continued Militarization of Sri Lanka". Journal of Foreign Relations. Archived from the original on 26 November 2011. ^ "SLA opens 'luxury' resort in occupied Tamil land". TamilNet. 5 October 2011. Archived from the original on 7 November 2011. ^ a b c d Jayasuriya, Ranga. "Army's new civilian role - is this a good signal?". Lakbima. Archived from the original on 25 April 2012. ^ Dias, Supun (6 November 2011). "Army to build a five star hotel in Colombo". Daily Mirror (Sri Lanka). Archived from the original on 7 November 2011. ^ "RESTORE CIVIL ADMINISTRATION IN ALL ASPECTS TO ENSURE DEMOCRACY". The National Peace Council of Sri Lanka. 1 June 2011. Archived from the original on 2 April 2012. ^ a b Samarajiva, Indi (4 April 2010). "Military Tourism". Sunday Leader. Archived from the original on 17 April 2010. ^ "Ripples as Navy sails into whale-watching business". Sunday Times (Sri Lanka). 30 January 2011. Archived from the original on 23 November 2011. ^ "Helitours dressed up; ready to go as a commercial venture". Sunday Times (Sri Lanka). 18 July 2010. Archived from the original on 21 December 2011. ^ Abeywickrema, Mandana Ismail (24 April 2011). "University Students To Be Trained By Military". Sunday Leader. Archived from the original on 29 April 2011. ^ Haviland, Charles (19 May 2011). "Sri Lanka students fight military training scheme". BBC News. Archived from the original on 23 May 2011. ^ Hensman, Rohini (14 June 2011). "Sri Lankan universities are no place for the army". The Guardian. Archived from the original on 4 June 2016. ^ Haviland, Charles (3 November 2011). "Sri Lanka army to run cricket stadiums". BBC News. Archived from the original on 7 November 2011. ^ "Three Test venues handed to military for maintenance, confirms Sports Ministry". Sunday Times (Sri Lanka). 5 November 2011. Archived from the original on 6 November 2011. ^ Abeywickrema, Mandana Ismail (23 January 2011). "The Militarisation Of Sri Lanka's Diplomatic And Administrative Services". Sunday Leader. Archived from the original on 28 January 2015.